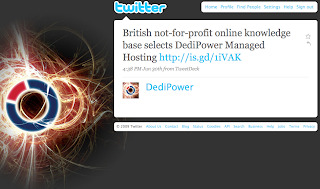 Special Member Offer: One Month Free Hosting with DediPower! 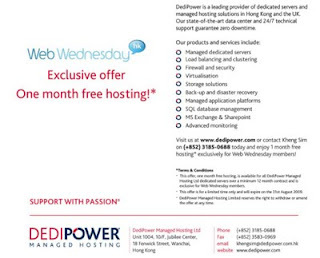 As a follow up to their generous sponsorship of Web Wednesday HK's 2 Year Anniversary (May '09), DediPower (www.dedipower.asia) is now offering our members One Month's Free Hosting. All you need to do is contact Kheng Sim on (852) 3185-0688 and commit to a 12-month contract of their 100% uptime managed hosting services. You've got until 31st August to take up this opportunity, so Power up on Dedi now! You can follow them on Twitter (twitter.com/dedipower). According to their groovy interface, their most recent client is knowhownonprofit.org, a knowledge base for "everything and everyone you need to know to run a non-profit". Good on yer! Thanks to the able (and patient) ears of Henry Oh, Co-Founder of Socialutions and the Hong Kong Start-up Association, we can now bring you the upgraded audio recording of my interview with Benjamin Grubbs, Regional Head of Interactive Media for Turner Entertainment Networks Asia, owners of Cartoon Network Asia. Benjamin refutes the rumour that ecommerce is not booming in Asia and gives us insight on Turner's ventures into online gaming (Ben 10, Tom & Jerry and other cartoon characters), new forms of interactive education (Mathletics), user-generated cartoons (ToonCreator), virtual merchandise and creative ways for content owners to work with advertisers online. Recorded at Web Wednesday Hong Kong V26.0 at Volar in Lan Kwai Fong on Thursday 2nd July, 2009. A shout out to Ben Grubbs for being a highly informative and savvy guest at our July mixer. We'll be posting the podcast to this blog and our podcast channel (podcasts.webwednesday.hk) within the next few days. and have developed several iPhone apps. 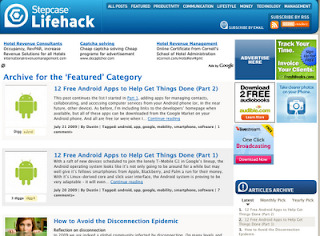 From the Lifehack.org website, "This site is dedicated to lifehacks...hacks, tips and tricks that get things done quickly by automating, increase (sic) productivity and organizing... endorsed by many major newspapers and publishers...rated in the #100 most popular blog by Technorati." We'll be talking about how to get things done in a digitally-cluttered world, how to survive the daily demands of social media (and still keep your job!) 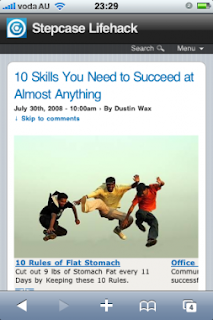 as well as how to successfully port your business to the iPhone. Leon obviously practices what he preaches as, given all his entrepreneurial endeavours, he still finds time to tweet, blog, post photos to Flickr and share interesting website links on del.icio.us. And if you want to get to know him more, you can view his profile on LinkedIn, bug him on Facebook as well as track him down on FriendFeed. The night kicks off at 6:30pm and ends around 9:30pm, so you'll have plenty of opportunity to mix with the movers and shakers of our local Internet and global blogging communities. There will be an entrance fee of HK$100, unless you're a bona-fide student, in which case it's HK$50. This includes one complimentary drink. All other drinks are at Happy Hour prices. (We will issue a receipt, if you require one). As per usual, we will donate 10% of entrance fees to a local charity (this time, we're looking at Oxfam's local programmes). Do invite fellow GTD practitioners to join the Asian Digerati on Wednesday 5th August at Volar Bar & Club, Basement, 38-44 D'Aguilar Street, Lan Kwai Fong, Central. Sign up for the event on Facebook, LinkedIn or on this blog.